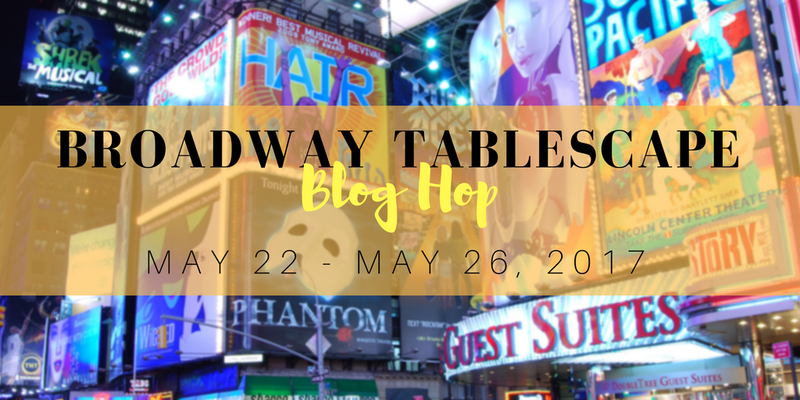 The Tony awards for the best of Broadway are coming up, so what better theme for a blog hop than Broadway Tablescapes, coordinated by Chloe at Celebrate and Decorate! Plus, today I have some additional surprises for readers, so come along we have things to see, games to play and a giveaway too! The actual award ceremony is June 11, so you have lots of time to see all the inspiration. My inspiration for a tablescape and party come from an old theater I used to go to many years ago. It was a stage theater that was remodeled into a movie theater. The colors, as often are the case for stage theaters, were deep burgundy red and gold. Ornate doorways with gold leaf carvings were gateways into another world for just a couple of hours. Deep burgundy red draperies hung on the walls and across the stage with heavy tassels and gold fringe on the bottom. Heavy brass railing went across the balcony, and matched the wall sconce lighting that dimmed to just a soft glow, instilling a hush across the audience as attention shifted to the stage. There was always a bit of excitement and anticipation as the lights dimmed and the curtains parted to reveal the screen and the beginning of the feature. I challenged myself to create this table using only what I already had. Starting with the base, I put a dark burgundy square tablecloth on the table on point, resisting the urge to buy one that would cover the whole table. I have a pale gold lightweight wool shawl, and I placed it in the center, bunching it up a bit in the center and trailing the fringe on each end. 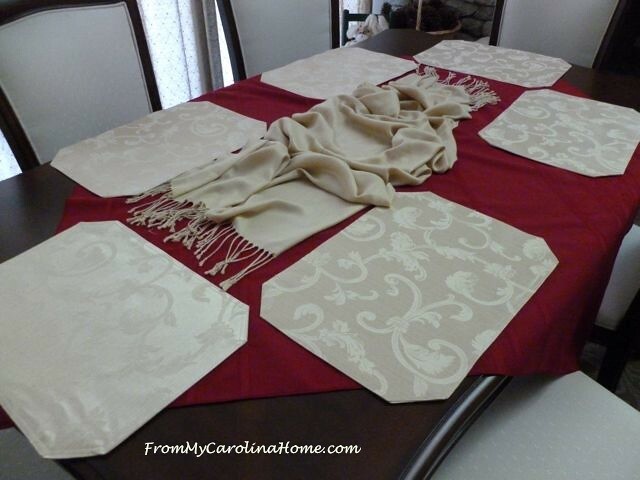 My ivory damask placemats went on top. From the den, I snagged the little lamp we use when watching movies for the center of the table, rather than using candles. The low light is helpful on the eyes when we darken the room for movie nights. The lamp again reminds me of the low lighting of the stage theater. I ran the cord under the shawl. There is a plug on the floor not to far away from the table. 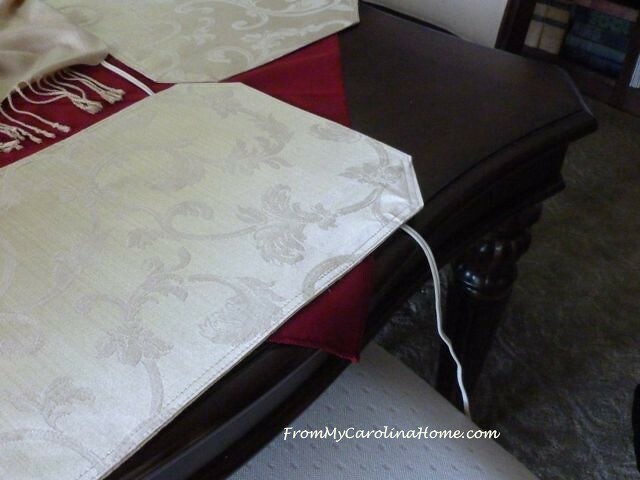 The cord goes under the placemat at my place setting, then down to the floor and an extension cord to plug in the lamp. I’ll make sure the cord is covered with a small throw rug so no one will trip on it. 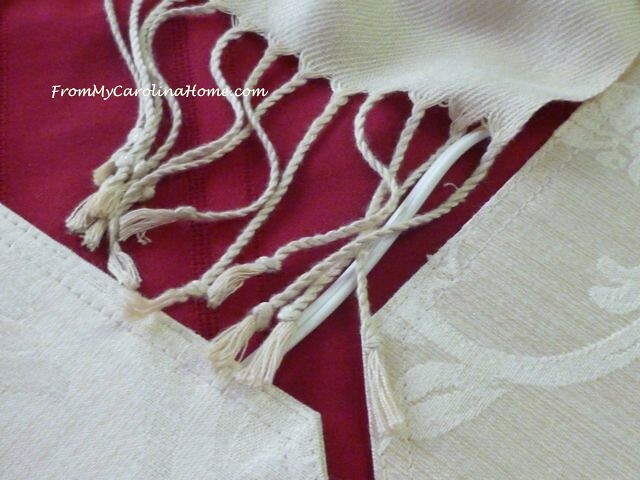 On the table, the shawl fringe hides the cord nicely. 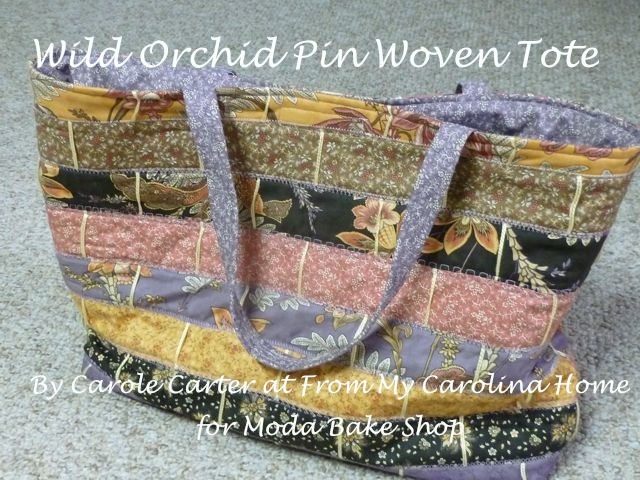 For a little glamour befitting an awards show, I added a couple of my vintage evening bags. I’ve used them on a table before too. I picked two that were gold or glitzy to keep with the theme. From my holiday box, I pulled the gold star wire garland to add a bit of glittery starry shine to the table. 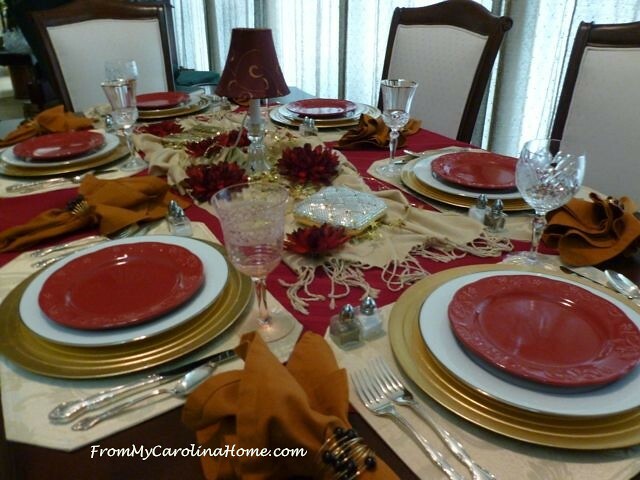 Each place setting has a gold charger, white china dinner plate, and dark red salad plate. The wine glasses are cut glass or etched glass in crystal with gold rims or soft pink. I don’t have six matching stems, so I mixed three patterns around the table. Each setting also gets individual salt and pepper shakers. Dark gold napkins are held with gold beaded rings. The good silverware is on this table too. As I stood back, it seemed to be almost but not quite finished. It needed just a bit of something more. I pulled some silk flowers out of the flower stash, and removed the them from their stems. Scattering the dark red flowers around the centerpiece finished it off, adding just that touch of red that was missing. Then, I turned off the lights and waited for evening to fall so I could see it with the lamp lit. Perfect. How fun is this!! It brings that theater experience to the table. The only problem is daylight saving time means we’d be eating really late. That probably won’t happen on a Sunday night. These award shows should be on Friday or Saturday, when it is more feasible to have guests stay late. 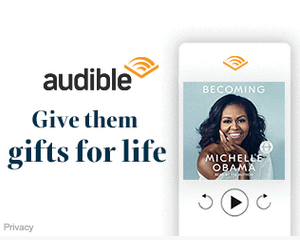 But, of course, if you really want to, you could record the show, and watch it a few days later when it is easier to stay up and have people over later. And you just might want to do that with the game I have for you, Broadway Bingo! The rules are quite simple, play just like Bingo. 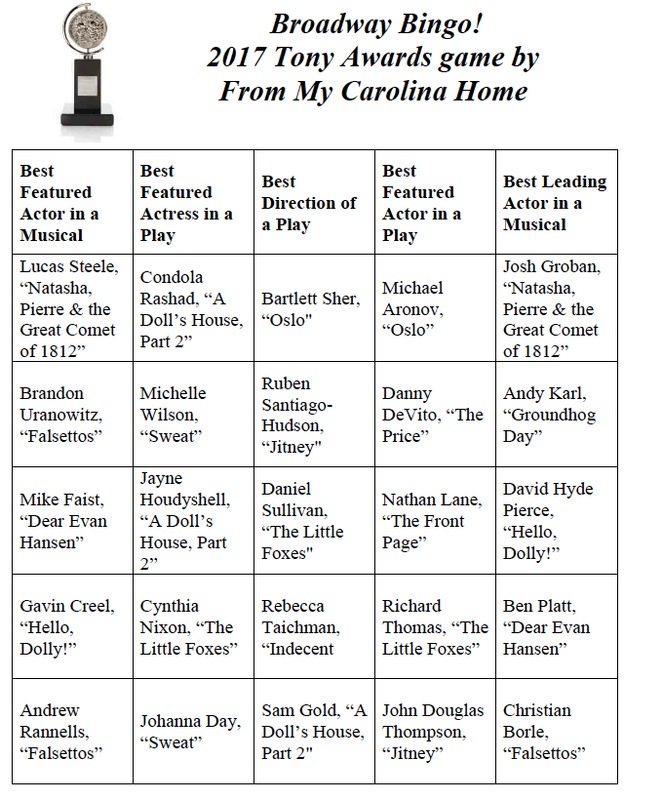 Each of the 8 provided play sheets are different, with five different categories each containing five nominees for the 2017 Tony Awards. Only categories with five nominees were chosen for the boards, such as Best Leading Actor in a Musical, or Best Featured Actress in a Play, along with other categories like Best Direction or Choreography. Mark winners as they are announced in the given categories. 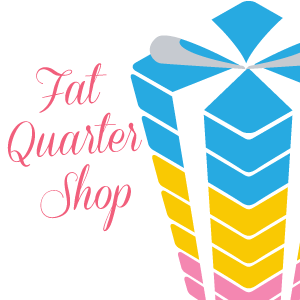 Participants can circle winners with ink, or use a yellow or light color highlighter. Five in a row, either across or diagonal is a winning board. There are two additional entries at the bottom of each sheet with Best Play and Best Musical for a second chance win, or use as wildcards. Family friendly for an evening of fun! Provide a few prizes for participants to win, inexpensive gifts with a Broadway theme are easy to do. 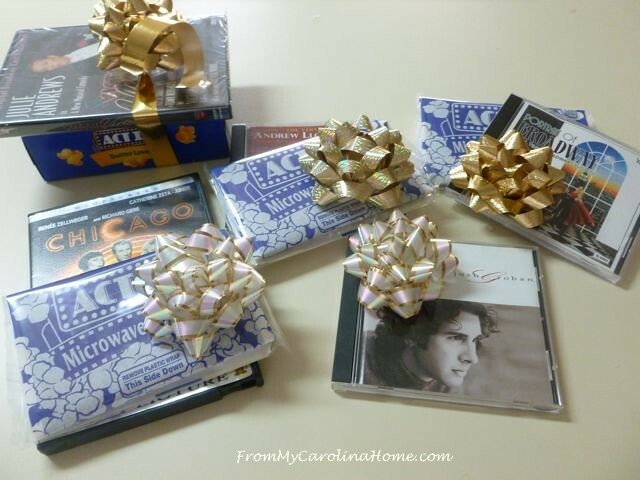 For example, prizes could be videos of Broadway hits made into movies, or books that became Broadway hits and microwave popcorn tied with ribbon. I used Act II brand popcorn just because it fit the theme. No one will mind if the videos or books came from the library secondhand sale. If no one wins, then have the participants put their names on the boards and draw one. 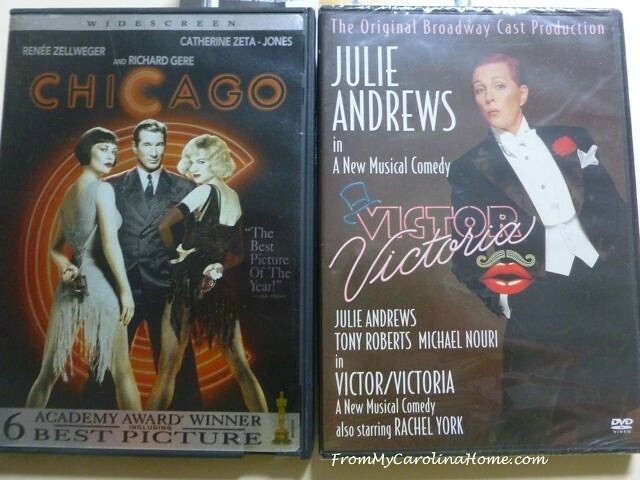 And now, a giveaway for readers for a new DVD of Victor Victoria with the original Broadway cast! I’ll also be giving away a secondhand DVD of Chicago. 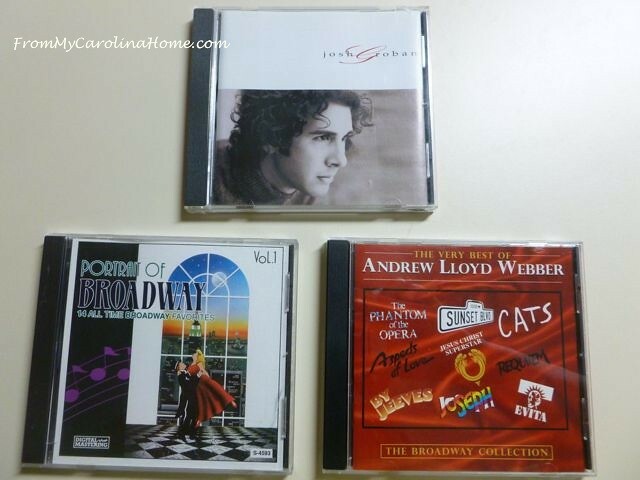 Then, a couple of lucky readers will receive a cd of Broadway music, or a Josh Groban cd. (Giveaway has been done.) Josh Groban is nominated for best leading actor in a musical for “Natasha, Pierre & the Great Comet of 1812” this year, and I am rooting for him to win. Yes, I will ship anywhere in the world! But, since the DVDs will likely only play on a Region 1 player, please let me know in the comments if you are outside of the US or Canada. To enter for the drawing, leave a comment on this post answering the question, what is your favorite Broadway show or musical from the past? You already know mine, Victor Victoria. Or, have you seen a Broadway show on Broadway? Followers may have a second entry with a second comment stating how you follow – email, Bloglovin, blog roll reader or Feedly. The drawing will be on Sunday, May 28th, winners will be notified by email. 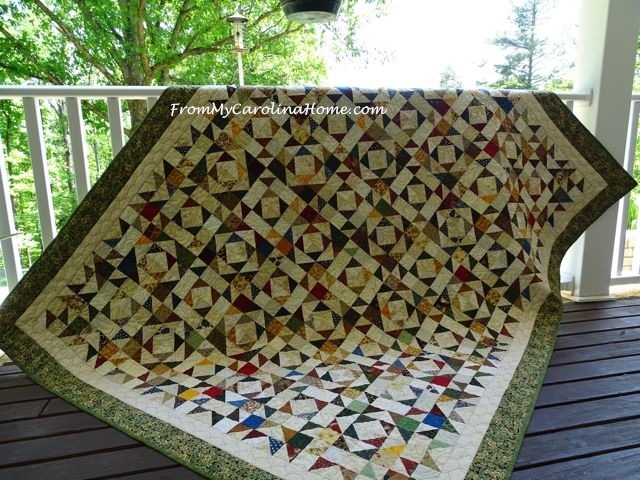 More fun for you today, a fantastic blog hop of more tablescapes with a Broadway theme. Be sure to visit all the bloggers this week for lots of great ideas. And thanks again to Chloe for coming up with this fun theme and putting the hop together. 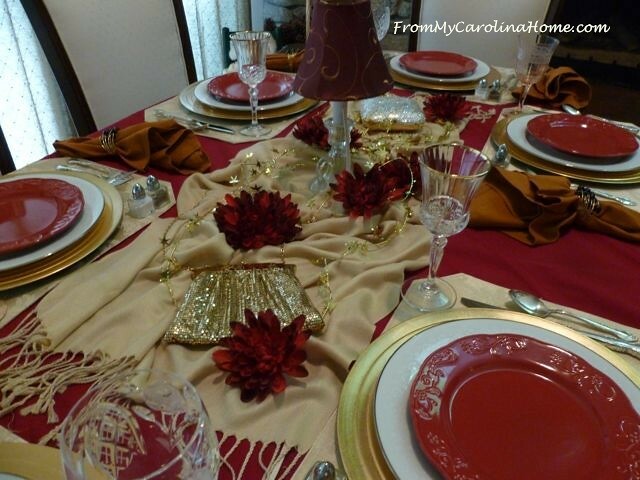 Her tablescape is scheduled for Friday at Celebrate & Decorate! Good luck in the drawing and have fun playing Broadway Bingo! What is your favorite Broadway play or musical? Have you ever seen a Broadway show on Broadway? Do you have a memory of an old style theater? Wow, you nailed the table setting! It’s gorgeous. Carole, this is a fabulous interpretation of the overall Broadway experience, and I love how you pulled it together! You’ll see one element with similar purpose used in mine if you visit later this week, and I love that we shared that piece of the thought process. 🙂 Your game concept and giveaway are nice perks to this presentation, and I wish your readers the best. It’s hard to pick a favorite show! 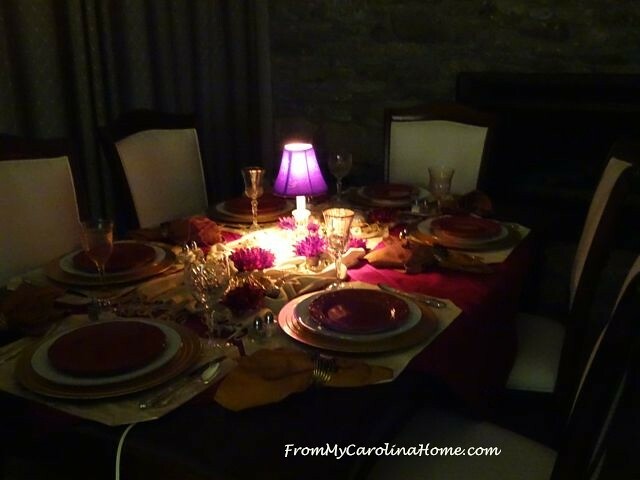 Another beautiful tablescape….the ambience is wonderful. The soft glow from the lamp really sets a mood! Makes me wish I was there…especially with some of your scrumptious meals on those plates! lol…. Beautiful table, it really does make me think of a grand old theater and the elegant atmosphere. I can imagine settling into a red velvet theater seat and the orchestra begin to play their first strains of the overture. You captured the mood and style perfectly. Thank you so much for being a part of the tablescape blog hop! Carole, I agree with Rita, what a beautiful Tablescape incorporating the theater experience. Your setting reminds me of the fabulous Fox Theater in Atlanta where I first saw Beauty and the Beast! Well, I have not been to a Broadway show, but hope to someday. My nephew wants to go to a performing arts college to perform in Off-Broadway shows. I’ve seen a few Las Vegas shows – The Producers was one. Your Tablescape fits the bill perfectly! My fave Broadway musical from the past is MISS SAIGON. I actually wept . OK…here’s my second and it will most certainly date me~!!!! OK, I know I’m old. Wow! You captured the feeling of a grand ole theater perfectly! I could almost feel and see the swishing of the heavy velvet burgundy curtains and all of the ornate detail that you’ll always see. Bravo! Oh my, where to start?! 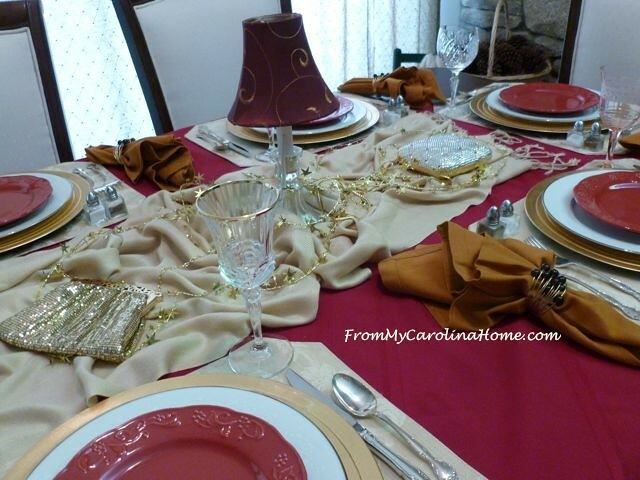 Love your tablescape ideas. . . your brain is “cooking” constantly, I believe! Now what meal are you serving “in theme”??? I bet that is your next post! Fiddler on the Roof is my all-time favorite – I think I’ve seen it off-Broadway, off-off-Broadway, an amateur theater somewhere we lived, & the movie, of course! We lived briefly (months) in Abilene, TX in 1996, & they had (have?) an old refurbished theater that showed oooooold classics every month. I think it was called the Paramount. A gentleman knowledgeable of cinema would give a little talk before the show, telling who had been originally cast as the main character, etc., very interesting & fun. Saw Casablanca for the first time there, age 40-something! Didn’t love it, but at least I can say I saw it! I do love being “connected” to your creative personality! I follow you on From My Carolina Home. Good luck, everybody! Let the fun begin! 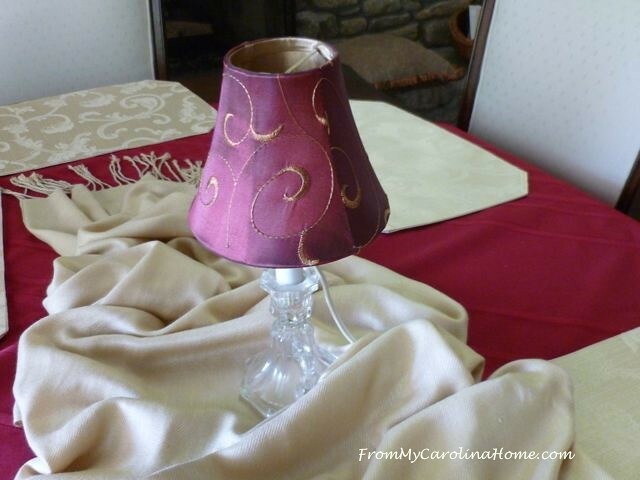 Carole, I love the idea of putting a real lamp on the table. What great ambiance. 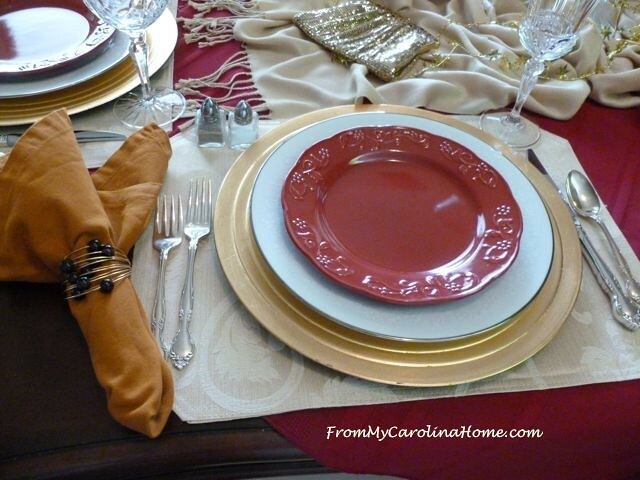 The golds and reds work beautifully together. Live the curtain go up! Very clever to recreate the old theatre ambience! Good job! The table is as pretty in the daylight as it is with the light turned on. Very clever too. It would be hard to choose a favorite show. I loved Evita as much as The Sound of Music. Beautiful tablescaping. 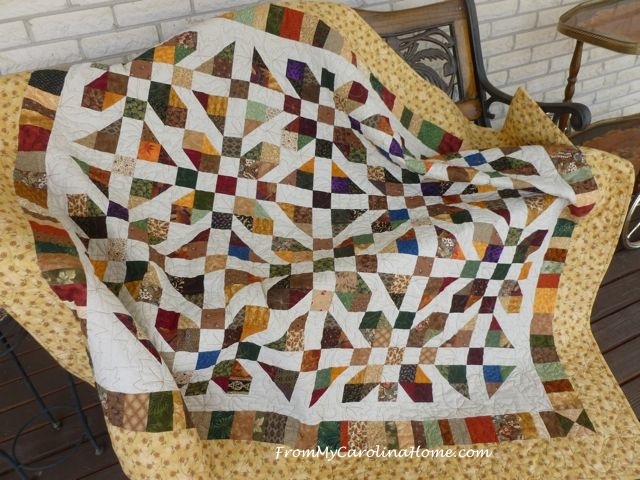 Really liked the runner in the center smushed up, have seen that done several years ago in a magazine and the effect is so dramatic, wanted to do that on my coffee table but alas haven’t done it yet, oh well, some day. Never been to a theater play before but I do love the musical movies, South Pacific, Cat on a Hot Tin Roof, Dr Zivago, my favorite-the song What Now My Love is one of my favorites. Carousel was on the movie channel last week so watched that. There are so many great movies and theater musicals and they aren’t on the T.V. very often. Went to Phipps Plaza Arena and seen The Bill Gather Singers with a friend a couple years ago and recently went to The Fox Theater and heard the Irish Mens Group, what a treat. Enjoyed the Mary Poppins table scape, so many terrific ideas and the color schemes as well. The light on your table in the evening picture was beautiful. Looking forward to seeing everything you ladies come up with. Have a great day, I’m planning on making some soft banana chip cookies this morning with buttermilk in them. Mama had this recipe and I haven’t made them in a long time and they are terrific . Lovely, lovely, lovely. Pure eye candy for me who lives remotely in the Pacific Northwest forest! Sighhhhhhh! I have gorgeous wildlife and nature out my window but long for dinners etc like yours! Thanks for the virtual moments! You’ve created a beautiful table and it must feel nice and cozy to sit here. I love the ambience created by the lamp and the color palette is perfect. Thank you for the download and the giveaway. Outstanding job! My favorite is “Phantom of The Opera”, followed closely by “Les Misérables”, and “Cats”. You have me wanting to do special tablescapes. What a beautiful and elegant table setting you’ve created. I’m sure anyone dining at your home would feel so honored. Great game too. There are too many plays I love, so it would be hard to choose. Beautiful table with ambiance. Love the use of the lamp. of course I love your choice of colors, red and gold. Rich and decadent. I had forgot to say i love Mama Mia. We saw it in London. This is incredibly beautiful. I love all of your decorations! What a fun night for you and your guests. I can imagine everyone dressing up in their finery to attend your special event. Some trivia about these movies would be fun too. Beautiful decorations! Congratulations. I’m a fan of On Golden Pond. Absolutely loved the movie and the actors who played the parts. A real tear-jerker for me every time I watch it. 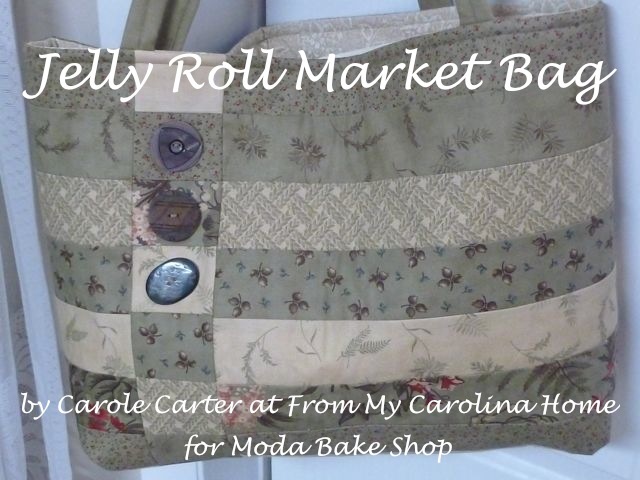 I also follow you via e-mail for your blog – My Carolina Home. Your table setting, with one lamp there, is truly beautiful. Broadway, no, not down here, but I do remember when I was about 10, my Mum and Dad took me to see the ” Ice Follies ” in Auckland, and it was Rose Marie, with the CMP, arm in arm, skating round and round in a circle. Truly magical. Your table setting is so lovely and I marvel at your creativity especially pulling items that you may already have. My only experience “on Broadway” was Mama Mia with a few friends visiting NYC. It was so fun – we went out and purchased the CD immediately. Coming home to Minnesota…my non-musical husband….couldn’t stop listening to those tunes. We still love it! Your table is lovely. Very old theatre. I miss NYC and half price tickets. Best old time (many years past) probably Yul Brynner in. The King and I or Camelot or maybe Cats…too many to pick from. I follow with email. Aren’t you clever! What a beautiful table setting. You’re inspiring me to put a little more effort into setting our dining room table. Everything around here is rustic so I would probably have to go with a theme from “Oklahoma” or “Annie Get Your Gun”. LOL. I have actually been to a couple of musicals in beautiful old theaters in Vienna, but I was a child and didn’t take time to appreciate the history and incredible surroundings at the time. I have seen “Cats” in Albuquerque, NM and a beautiful rendition of “The Nutcracker” ballet at a historical theater in San Antonio, TX. Phantom of the Opera would be my favorite! 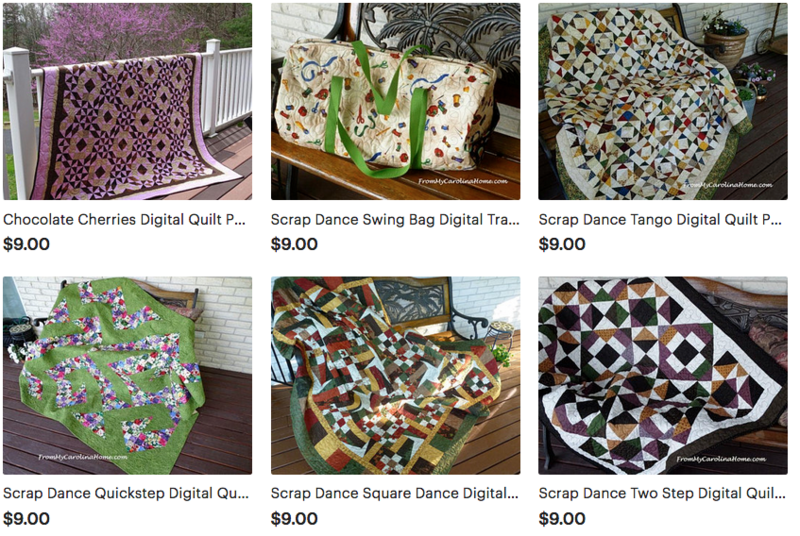 I follow you by E-mail and Bloglovin–I really enjoy your Blog and all your quilting and decorating ideas–am down loading the current Mystery quilt and have made a tablerunner and a handbag from your patterns that I like very much–Thanks for all these! I have to admit I don’t think I have ever seen Victor/Victoria. My bad. I have always enjoyed musicals and have attended many ‘off Broadway’ when they come to my home town. I still remember one of the first I ever watch which was West Side Story. I love your table setting. I adore your inspiration. Old theaters have so much character and are so romantic and the classic red curtain. Your interpretation is beautiful. 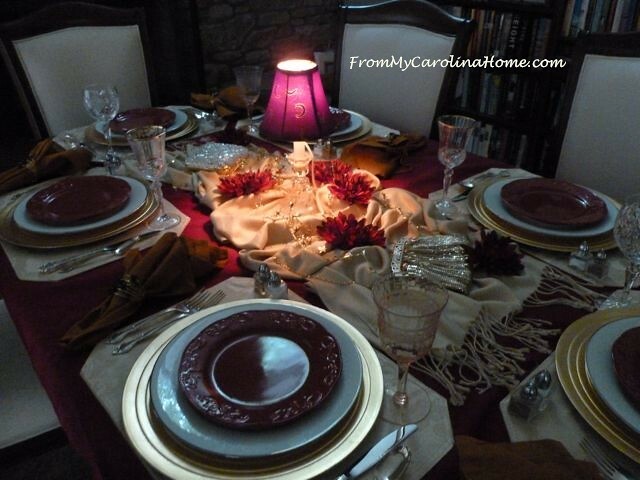 Beautiful table settings and the lamp must cast the perfect glow. What a super cool table, You spin on the broadway experience, is very brilliant, love the colors so rich and vibrant. Oh, this is such fun. 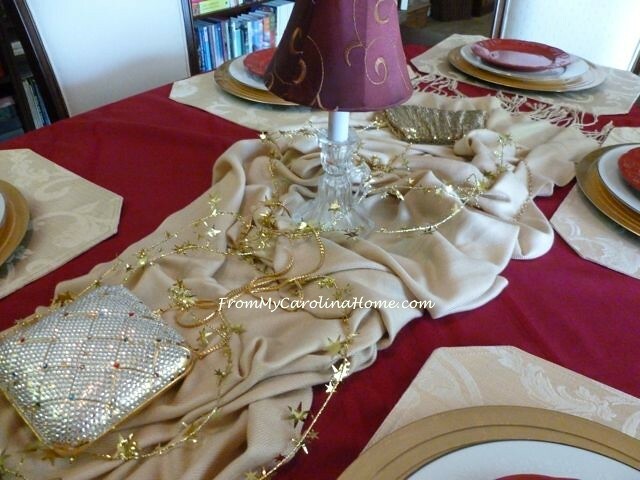 Your beautiful table does indeed fit the elegance and the theme perfectly and I love the details of the lamp (great idea with the cord), the shawl and handbags! And extra fun to do it with what you have on hand. I’ve seen hundreds of musicals in my life — theatre major, actor, director in my previous life and still have a passion for it. My favorite remains “Gypsy.” I’ve seen several versions (my most memorable experience being in the third row for Angela Lansbury’s performance as Rose in 1973 and my favorite the recent version with Imelda Staunton, which I’ve only seen on PBS). I named my cat Gypsy after the show, and my blog, “The Marmelade Gypsy” is a tribute to both the feline and Broadway Gypsy. But Stephen Sondheim’s “Follies,” my first Broadway show, is a close second! I LOVE LOVE lamp light. (I know that sound wierd…but not everyone uses lamps….I LOVE THEM!!!) You table makes me want to sit and eat and enjoy good company for hours!!!! We use to belong to a cooking club and we did thematic dinners….your post reminds me of all the fun we had!!! I follow by e-mail. 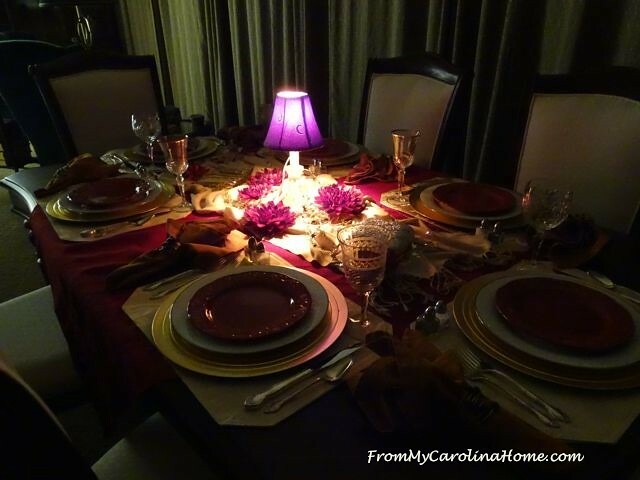 Your tablescape is gorgeous, and what fun such an evening with friends would be! I have seen a Broadway play on Broadway, and some off-Broadway ones, too. My favorite was Man of La Mancha, which I also saw in Los Angeles, and they were equally good. I love the music from that one, too. Phantom of the Opera is a favorite of mine, and I loved the 25th anniversary showing of it that was done, I think through PBS. I definitely tend toward musicals! Thanks for an interesting question, and an interesting giveaway. Fingers crossed for Josh Groban, too. Just been catching up on all your recent posts, Carole. Reading them in one go makes me realise how busy you are. You seem to pack plenty into your days. Enjoyed reading about your recent trips with your husband. That’s a lovely table, Carole! My favorite musical is Brigadoon. Other favorites include Seven Brides for Seven Brothers and Kiss Me Kate. Absolutely beautiful!! Love the unexpected elements you brought in. It really reminds me of old Hollywood! What a fun tablescape theme! I love the Broadway Bingo! Thanks for sharing @Vintage Charm!